There are three legislative assembly constituency in Sant Kabir Nagar district for the 2017 Assembly elections. They are 314 Dhanghata, 313 Khalilabad, 312 Menhdawal. When Uttar Pradesh assembly election 2017 is getting ready to electios new Assembly, Sant Kabir Nagar is not anywhere behind in the election heat. Sant Kabir Nagar district (Hindi: संत कबीर नगर ज़िला, Urdu: سنت کبیر نگر ضلع‎) is one of the 75 districts of Uttar Pradesh state in northern India. Khalilabad city is the district headquarters. 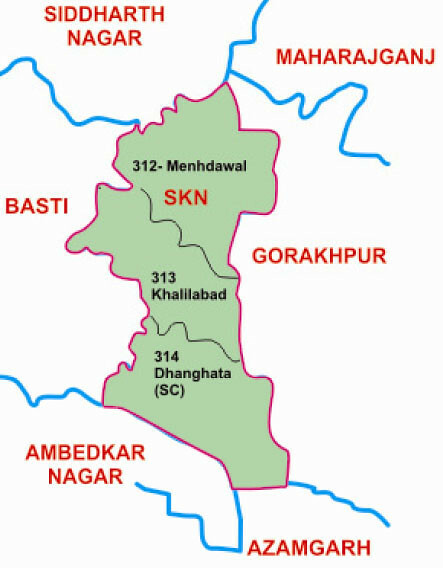 Sant Kabir Nagar district is a part of Basti division.